People call them coffee beans, but actually they’re seeds from the center of red, coffee cherries. Photo credit: Sara Light-Waller. Santa Lucia Coffee Roasters opened in April of 2006 at its current location, a charming, adobe-faced shop in Centralia’s historic downtown. 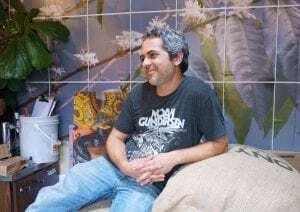 Justin Page, Santa Lucia’s inspiring founder, got his first taste of coffee culture in Seattle in the 1980s where coffee houses like Starbucks, Espresso Vivace, and Il Giornale served up regional and specialty coffees. 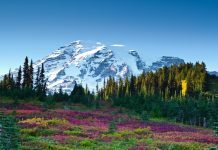 Justin found particular inspiration in Seattle’s walk-up espresso stands, where leisurely conversations with baristas enhanced the coffee-drinking experience. Sometime later, Justin built his first coffee roaster in the basement, the prototype of the one used at Santa Lucia today. “Coffee is a journey,” says Justin. Santa Lucia Coffee is named after Justin’s wife, Lucy, a familiar face at the coffee house. According to Justin, “Lucy’s always here, running the place.” The Page children — Lenora, Miles, and Margaret help out, too. Lenora, the eldest, assists at the bar, while Miles and Margaret help with cleaning and set-up duties. Other family helps out too. Justin’s sister, Summer, is the family baker and creates most of Santa Lucia’s yummy snacks. The other baked goods are sourced from Olympia and Rainier. Justin Page is the owner of Santa Lucia Coffee Roasters. Photo credit: Sara Light-Waller. Besides being a micro-roaster and coffee house owner, Justin also owns and operates Crystal Clear Window Cleaning, a residential and commercial window cleaning service. Lucy Page works part-time as a doula and birth assistant with Confident Birth Doula Services and Around the Circle Midwifery, LLC. Lucy and the children are regular participants in Centralia’s community theater scene. She and the kids appeared earlier this year in “Once on This Island” at Centralia College. Lucy and Lenora will be in “It’s a Wonderful Life” at the Evergreen Playhouse in December and Lucy will appear in “Godspell” next Spring. Santa Lucia’s coffee can’t be bought at the market, as the beans are exclusively sourced through direct trade with farmers. And the beans have a pedigree, too. They’re grown in micro-lots, segregated by variety, elevation, and specific growing conditions. Each micro-crop produces coffee with unique qualities and flavors, something that you won’t get in generic coffees made from blended beans. 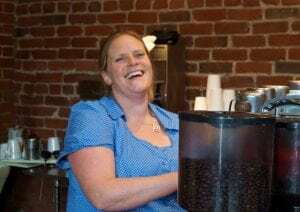 Lucy Page smiles as she serves up great coffee. Photo credit: Sara Light-Waller. People call them coffee beans, but actually they’re seeds from the center of red, coffee cherries. Coffee is grown on hillsides at high elevations. The coffee cherries must be picked when perfectly ripe to produce a good product, and a farmer will return to his fields five or six times to hand-pick the reddest, ripest cherries. “Somebody had to love you that hard to get this drink to you,” says Justin. Justin showed me a tincture made from reconstituted cascara (coffee cherry husks). With the addition of a small amount of sugar, the resulting drink is a delicious, sweet, cherry-flavored light syrup with a hint of coffee and apparently, no caffeine. This unusual drink is also coffee, says Justin, just not the type of coffee that we’re used to. The Guatemalans use cherry husks to make tea, but Justin’s cascara tincture is unique to Santa Lucia. Modern coffee drinkers have sophisticated tastes. They easily recognize “nuances and differences in what you’re doing in the roasting room,” says Justin. But having a shared vocabulary isn’t the only way to better a customer’s coffee-drinking experience. 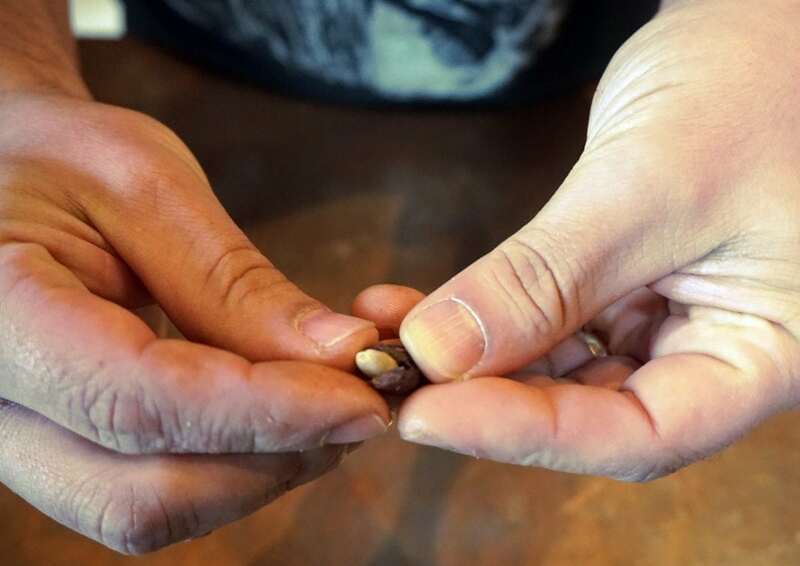 Sharing the coffee’s story, engaging with customers, and putting “every ounce of love and passion into what you do” is a satisfying recipe for coffee house success at Santa Lucia Coffee Roasters. Justin thinks that in the coffee business, as in life, intention is everything. It takes coffee from being just good enough to something very, very special. Santa Lucia Coffee Roasters is located at 202 S Tower Street in Centralia, WA. For more information, you can call them at 360-807-9600, or find them on Facebook or Twitter.